It’s common for software-as-a-service (SaaS) companies to offer free trials. That’s because a lot of times they work. Done well, free trials can be a very effective way to attract new customers. But done poorly, they can be an expensive failure. I’ve seen SaaS companies make several common mistakes with their free trials. Sure, it’s called a “free trial.” But to the SaaS vendor, it’s not really free. They’ve paid to build and host the solution, and attract and support the trialer. And it’s not really free to the trialer either. They’ll invest a fair amount of time learning and evaluating the solution. So if you’re going to offer a “free trial,” recognize that it actually will cost something. Free trials make sense for certain solutions and markets, but not all of them. For example, customers might not be eager to deploy a critical enterprise application throughout the entire organization as a free trial. There’s just too much at stake. Talk with your prospective customers to see if they’d consider taking on a free trial. You might find that they’re not as eager as you might expect. If you want free trialers to see the value in your solution, you need to take them by the hand and show them. If you let them just wander around, don’t expect they’ll see what you want them to see. Whether through a phone call, email, video, sign-posts in the trial, or some other way, walk the free trialers to the handful of awesome features and benefits that you think will cinch the deal. And try to get them there in less than a few minutes. Just because someone signed up for the free trialer doesn’t mean the marketing and sales job is done. It takes some work to convert them into a paying customer. They need to be shown the value in the solution (see item 3, above), push it to the top of their to-do list, allocate budget, and trust the vendor. All that might not happen by itself. It requires some effort. Just because a free trialer didn’t convert to a paying customer at the end of the trial doesn’t necessarily mean they’re no longer a prospective customer. It doesn't always mean that they've purchased another vendor’s solution or changed their mind. They simply got distracted by other priorities and the trial period expired. Stay in touch with these “lost" trialers. At some point, whatever problem they had that caused them to sign up for the trial in the first place will probably bubble back up to the top of their priority list. When that happens, you want to be top-of-mind and give yourself a second chance. After months or years of development, your software-as-a-service (SaaS) solution is finally ready. Now you just need to find customers. post to a blog. On top of that, you toss in a bit of search engine marketing and prepare a couple of press announcements. You could call this an "all of the above" customer acquisition plan. But it might just be random acts of marketing. Though the individual elements may be executed well, this shotgun approach to customer acquisition usually doesn't produce much in the way of results. You end up with an attractive website, a beautifully-produced video, and well-written blog. Unfortunately, you don't end up with lots of paying customers. That's because the individual elements are not connected and don't fit into a logical process. They don't move a buyer step-by-step toward a purchase. You might generate lots of visibility and web visitors, for example, but unless there are elements in place to capture contact information from the visitors, all that web traffic doesn't mean much. Unique visitors, by themselves, do not generate revenue. Or maybe the website is, in fact, capturing contact information. But there's nothing in the marketing plan to cultivate those leads and convert them into qualified opportunities and buyers. In that case, you've collected an impressive list of contacts, but no revenue. Or maybe the tactics in place are effectively leading prospects far enough through the process that they actually purchase your solution. But there's nothing in place to retain these paying customers. So you end up with lots of customers that go away after a few months. These kinds of gaps in the process happen all the time and it's very understandable. By the time they're ready to go to market, companies have spent lots of time and money building their SaaS solution. They're proud of what they've built and eager to tell the world about it. And they're in a hurry to start selling it. So they just starting "doing marketing stuff." There's lots of scrambling to put up a website, get out emails, crank out press announcements, post videos, and do whatever else seems like it might be a good idea. But companies really need a plan in place before they start executing on all these tactics. Otherwise all that activity is a waste of money. That's money no company can really afford to waste, especially SaaS companies. The website, email, webinar, video, tradeshow and whatever else seems like a good idea costs money now that they need to earn back over time. That's how the SaaS business model works. Make sure the individual elements fit together. For example, if an email campaign is intended to drive visitors to the website, make sure there's a way to capture contact information from those visitors. Cover all steps in the customer acquisition and retention process. Don't focus exclusively on programs that generate leads, but neglect tactics to convert leads into customers. Don't work hard to acquire paying customers, but forget about programs to retain them. For most SaaS companies, it shouldn't take more than a few weeks to put together a workable plan. It's time well spent. watch a demo, and then buy. With SaaS solutions, the end-user is often doing the evaluation. It’s the sales manager who’s evaluating a SaaS sales tool, the finance manager who’s evaluating expense reporting solutions, or the HR manager who’s evaluating a time & attendance tracking solution. call from the vendor, but other prospects might not be so far along in the process. It costs SaaS companies $1.07 in sales and marketing expense to acquire $1.00 in annual contract revenue. So says excellent research on the experience of SaaS companies, prepared by David Skok along with Pacific Crest Securities. The SaaS companies included in their survey spent, on average, $1.07 on sales and marketing to win a customer that would be worth $1 in annual contract value. That ratio - $1.07 in customer acquisition costs (CAC) delivers $1 in annual contract value (ACV) - is great news. Here’s what that number means. If a SaaS business wisely invests $100 million in customer acquisition costs, they’ll earn nearly all of it back from customer revenue in the first year. And if they can hold onto those customers for a second year, they’ll earn another $100 million in revenue, and in the third year, another $100 million. In other words, the first $100 million in CAC earns nearly $300 million in contract revenues over three years. With that kind of return, the SaaS company should put as much money into CAC as it can get its hands on. And second, for the sake of making a point, I’ve omitted the cost of retaining an existing customer. The Skok survey shows that companies will pay 12 cents annually to retain an existing contract worth $1.00. Factoring that in, the cost to acquire $300 million in contract value over three years is closer to $131 million. Still not too shabby. So with such an impressive return, why the resistance to spending on customer acquisition? It may come from a couple sources. That’s a lot different than the traditional on-premises business model that charges large up-front fees for software, plus on-going maintenance fees. In that scheme, companies might allocate 4, 5, perhaps 6 percent of annual revenues to marketing. There might also be a misperception about how much sales and marketing really costs. Companies should expect to pay well if they want it done well. It costs money to design and maintain an effective website. It costs money to prepare compelling content. It costs money to design an effective customer acquisition plan. And it costs money to execute effective search engine marketing and social media campaigns. The experts who do this work don’t do it for free. Of course, companies should take advantage of newer sales and marketing tactics, like social media and inbound marketing. These can get them in front of prospective customers much less expensively and more effectively than they could have done several years ago. And for some solutions, building a viral component into their product can be a powerful way to gain customers. But even with greater efficiency, customer acquisition still isn’t cheap. SaaS companies pay a lot for excellent developers and UX designers. They should expect to pay a lot for excellent sales and marketing people too. There’s a reason that sales and marketing expenses at even well-established SaaS companies account for their single largest on-going expense. Workday’s sales and marketing expenses, for example, represented 56 percent of their annual revenue according to their most recent annual financials. Instead of looking at customer acquisition costs as an expensive burden, people should be looking at them as an investment. And with returns of 200, 300, maybe 400 percent, a fairly lucrative investment at that. Microsoft is running an ad on television that I think may be trying to demonstrate the value of software-as-a-service (SaaS) and cloud computing. It shows a mother who's having a problem composing a family photograph. To cut and paste different images into the photo, a la Photoshop, she appeals for help "to the cloud." You know the story of the blind men, each touching a different part of an elephant. One touches the leg and insists it's a tree. Another one touches the tail and claims it's a rope. A third one touches the elephant's trunk and is convinced it's a snake, and so on. If we added the woman from the Microsoft "cloud" ad into this story, she'd be touching a discarded peanut shell that the elephant dropped a long way back on the trail. In other words, not even close. It's sometimes difficult to explain SaaS and the cloud. One of the challenges confronting SaaS marketers is to educate all the buyers in the decision making process about this new mode of computing. Education is essential to winning the prospective customer's trust, and winning their trust is essential to winning their business. In this effort to educate prospective buyers, the Microsoft "to the cloud"/photo-editing/discarded peanut shell TV ad doesn't really help. Sorry. "It's bigger than the application"
A different ad running on television is actually more helpful to SaaS marketers... and it doesn't involve SaaS, the cloud, or even technology. It's from Starbucks. The ad shows the process of creating a single cup of coffee for an individual customer, all the way from the plantation to the cup labeled with the customer's name, "Sue." It closes with the tag-line: "You and Starbucks: It's bigger than coffee." The message here: Starbucks is not just about the coffee. It's about the entire experience. They're marketing a relationship with the customer that goes beyond the product. In fact, they've even gone so far as to remove the word "coffee" from their logo. That's a useful lesson for SaaS marketers. 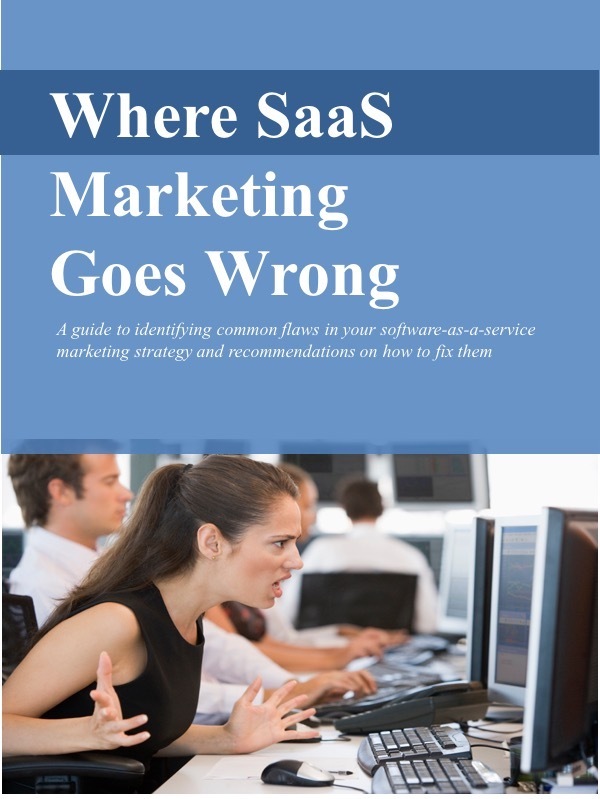 When it's done well, SaaS is marketed as more than just the application. It's about the entire customer experience: it's easy to purchase and deploy, simple to use, and painless to upgrade and maintain. In addition to the features and functions, SaaS is about a commitment to deliver an increasingly useful solution reliably and securely over the life of the subscription. It's bigger than the application. One of the more useful management development courses I've taken during my career is "Practical Product Management" from Pragmatic Marketing. True to its title, it offers a practical prescription for product managers to better understand the needs of the market: Talk with one prospect, one customer, and one evaluator every month. Product managers are instructed to use the information gathered in these discussions to become the authority within their company on what the market needs. They equip themselves to be "prospect" experts, not just "product" experts, and use their expertise to guide product development and marketing strategy. Product managers with on-premise solutions need to consciously establish this routine of systematically gathering market input. And the best of them do it well, diligently carving out time on their calendars to meet with customers and prospects on-site, at trade shows, and user groups. The sales and marketing for on-premise applications is essentially a straight-line process - running from "attract & cultivate qualified prospects," to "closing deals," to "deploying and supporting the application." Gathering useful input from customers and prospects requires that product managers establish an effective feedback loop themselves. In the SaaS world, this feedback process is built right into the model. Product managers automatically get input from every single customer every single day. They can see precisely how customers are using the product, when they're using the product, and where they're running into difficulty. They have access to hundreds of useful data points from hundreds or thousands of customers. Unlike the straight-line process of the on-premise model, under which product managers must establish the feedback mechanism themselves, the feedback loop is built right into the SaaS model. All current customers are prospects too and enhancing the solution to meet their requirements is essential to securing renewals. And SaaS companies require high renewals to succeed. The automatic feedback loop, built into the SaaS model, gives product managers a window directly into customer and prospect behavior. They should take advantage of that window and watch what customers are doing. As Yogi Berra would explain: "You can observe a lot just by watching." The Massachusetts Technology Leadership Council hosted a program on software-as-a-service (SaaS) sales and marketing issues last week that provided useful advice on how to use the unique qualities of a SaaS solution to enhance customer satisfaction. The program included a panel of executives who have had experience selling their solutions both under an on-premise model and via SaaS. In the SaaS model, the provider and the customer are more closely connected. For one, the provider is responsible for delivering the solution over the life of the subscription, in contrast to the on-premise model in which the customer licenses the solution and deploys and manages it on their own. In the SaaS model, providers and customers are also tightly coupled through the renewal mechanism, by which customers periodically renew their subscriptions. Happy customers are essential for renewals, and high renewals are essential for the provider's success. Their companies closely monitor customer satisfaction through their on-going connection to their customers. They do this through quantitative surveys, as well as through focus groups, observing customer behavior, and close review of support calls. Nancie Freitas, CMO of Constant Contact, explained how the company uses customer satisfaction data to drive product enhancements. Customer support reps work closely with engineering to address user issues, and each new release, delivered every two months, is explicitly designed to address flaws identified by customers. Success is measured by gains in the "net promoter score," the number of users who are likely to recommend the product to others. Some companies gather aggregate data on customer usage and provide it as benchmarks to their customers. This helps customers better assess their activity and understand best practices. Brian Zanghi, CEO of Kadient, explained that they monitor customer usage to identify follow-on sales opportunities. Heavy usage may indicate that the customer is a prospect for additional subscriptions. SaaS enables - in fact requires - that companies stay closer to their customers. Marketers should take advantage and leverage the insights gained from that on-going connection.